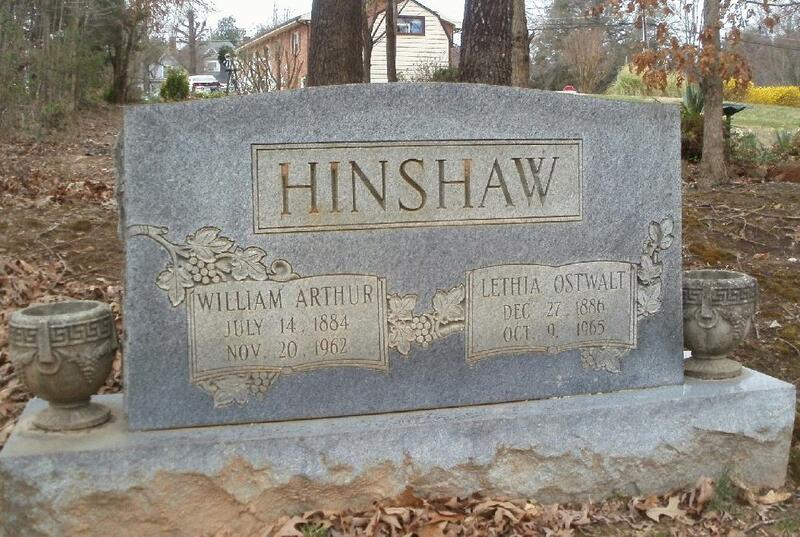 William Arthur Hinshaw2,5,6,7 [Arthur W. Hinshaw1,4]. Born Jul - 18861,5 [Jul 14 18842,4,6,7,8,9], North Carolina1,5 [Yadkinville, Yadkin County, North Carolina7, Guilford County, North Carolina2,6]. Hinshaw, Arthur W, head-of-household, age 24, born in North Carolina; parents born in North Carolina; first marriage, married 4 years; occupation: farmer, general farm; owned farm (free). Hinshaw, Leatha J, wife, age 23, born in North Carolina; parents born in North Carolina; first marriage, married 4 years; 2 children, 2 living. Hinshaw, Wesley B, son, age 3, born in North Carolina; parents born in North Carolina. Hinshaw, Cathaline, daughter, age 1 year 11 months, born in North Carolina; parents born in North Carolina. Henshaw, Arthur, head-of-household, age 37, born in North Carolina; parents born in North Carolina; owned home (free); occupation: farmer, farm. Henshaw, Lethia, wife, age 33, born in North Carolina; parents born in North Carolina. Henshaw, Byrd, son, age 12, born in North Carolina; parents born in North Carolina; attended school. Henshaw, Kathlyn, daughter, age 11, born in North Carolina; parents born in North Carolina; attended school. Henshaw, Bertys, daughter, age 8, born in North Carolina; parents born in North Carolina; attended school. Henshaw, Pansy, daughter, age 6, born in North Carolina; parents born in North Carolina. Henshaw, Stella, daughter, age 5, born in North Carolina; parents born in North Carolina. Hinshaw, Arthur, head-of-household, age 45, born in North Carolina; parents born in North Carolina; first married at age 21; owned home; no radio in home; occupation: truck driver, ice plant; not a war veteran. Conrad, Lethia, wife, age 42, born in North Carolina; parents born in North Carolina; first married at age 19. Conrad, Byrd, son, age 23, born in North Carolina; parents born in North Carolina; single; occupation: laborer, landscape garden. Conrad, Cathleen, daughter, age 21, born in North Carolina; parents born in North Carolina; married, first married at age 16; occupation: lopper, hosiery mill. Conrad, Bertys, daughter, age 18, born in North Carolina; parents born in North Carolina; attended school. Conrad, Pansy, daughter, age 16, born in North Carolina; parents born in North Carolina; attended school. Conrad, Stella, daughter, age 14, born in North Carolina; parents born in North Carolina; attended school. Conrad, Louis, granddaughter, age 4 years 6 months, born in North Carolina; parents born in North Carolina. Conrad, Tomas W, grandson, age 1 year 9 months, born in North Carolina; parents born in North Carolina. Hinshaw, William A, head-of-household, age 55, born in North Carolina; completed 4 years of high school; on Apr 1 1935 was living in the same house; owned home ($2000 value); occupation: farmer, farm. Hinshaw, Lethia Jane, wife, age 53, born in North Carolina; completed 2 years of high school; on Apr 1 1935 was living in the same house. Summers, Estelle, servant, age 40, born in South Carolina; completed 4th grade; on Apr 1 1935 was living in Newberry, South Carolina; worked 52 weeks in 1939; $156 wages in 1939, plus other income. 1910 census, Yadkinville, Deep Creek Township, Yadkin County, North Carolina; roll T624-1130, ED 138, page 1B, line #80, dwelling #15, family #15. Contribution from Matthew S. Marlier (). 1920 census, Benkelman Precinct, Dundy County, Nebraska; roll T625-991, ED 50, page 13A, line #26, dwelling #25, family #25. 1930 census, Rutherford College, Burke County, North Carolina; roll T626-1677, ED 10, page 4A, line #8, dwelling #61, family #61. 1900 census, Deep Creek Township, Yadkin County, North Carolina; ED 135, page 17A (49), line #28, dwelling #311, family #323. 1940 census, Rutherford College, Lovelady Township, Burke County, North Carolina; roll T627-2880, ED 12-10A, page 3A, line #11, household #43.